This car is fully modified to be legal in the International Hot Rod Association’s Hot Rod Class. It is also an NHRA legal Super/Street Car. This car currently exhibits 14.5 x 32 x 15″ Goodyear Tires on the front and the rear. The rear is a 9″ Ford with Moser Axels and a Strange 4:88 pro gear. The transmission is a Marco Abruzzi modified 2-speed powerglide. The car contains a 427 cubic inch, 575 horsepower engine. The body is a stock-appearing 1966 Nova with a full frame and complete roll cage from front to rear. The hood is a 1-piece lift off front end fiberglass. This Nova is proud to exhibit its best E.T. to date of 10.18 seconds at 137 miles-per-hour. It races at both IHRA and NHRA events. A long time veteran of our racing team was this 1992 Top Alcohol Dragster. It sported 18″ Wide, 36″ tall Goodyear Tires. The rear was a 9″ Ford Pro Assembly with a 4.56 pro gear. The transmission, a 3-speed manually shifted Lenco. The engine, a 448 Cubic inch 1998 Keith Black, all aluminum solid block with aluminum solid Brodix heads and a 1071 SS1 Blower and Pete Jackson aluminum fuel injectors. The car weighed 1830 pounds with a best ET of 6.52 seconds at 212 miles-per-hour. 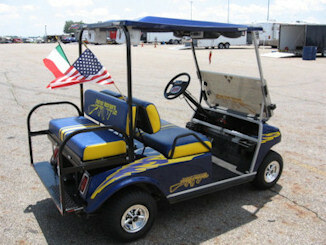 This is our 2005 Club Car Golf Cart with a Gas Engine. It sports a Midnight Pearl Blue Metallic paint job with custom yellow graphics. As we buzz the race tracks you will hear the Am-Fm-Cd Player w/remote control and 6 Speakers playing at 100 watt surround sound. Note the Crager SS Chrome Wheels and the Fold-Down rear seat that converts to a flatbed that comes in handy when we have to use the rear hitch. Comfort is guaranteed with the Custom Upholstery and the four convenient four cup holders. It also has Headlights, Taillights and an Emergency Siren to facilitate night time and emergency driving. We added a Tinted Windshield to keep our eyes safe and Rear View Mirrors just in case someone else tries to pass us. At night you can tell it’s us by the Under-body Purple Lights. Frank Vincent drives this mustang at selected events for Bill Schoenstein’s Team Premium Racing.